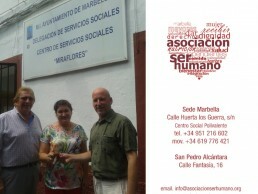 The charity operates out of offices donated by the Town Hall in the Miraflores district, one of Marbella’s poorest areas, as well as San Pedro Alcantara. Providing food daily for 400 people, half of them children, director Ana Garido explained that Ser Humano offers offers breakfast and lunch as well as a packed lunch for schoolchildren. People can eat in the canteen at the offices, or collect precooked food to be taken home. In addition the charity also delivers food to the elderly or disabled at their homes. “We have all nationalites and types of people here” explained Ana “because Marbella is like that. People come to us through the social services, health clinics, the Red Cross and others”. Ana showed us around the facilities including the men’s and women’s showers, the huge walk in fridges, laundry room and lastly the colourful children’s playroom.